Beautiful. And such a glorious future it is! I am the person responsible for making Connections. I will try to answer your questions and give you some insight to how the video was made. Can you give us a little background on yourself and how you became involved in the project as a producer? just discovered this blog via boingboing, and it's great! I like a lot reading of retro future, but I had never found a comprehensive source. Matt, I was the writer-director of "Connections," and while you're waiting for a response from Henry (who can give you all the "Genesis," details), I'll fill you in on the production itself: We shot the picture largely on purpose-built sets on soundstages at Universal-Orlando. This allowed much better lighting and background control for the necessary computer-generated effects, than would have "real" locations. 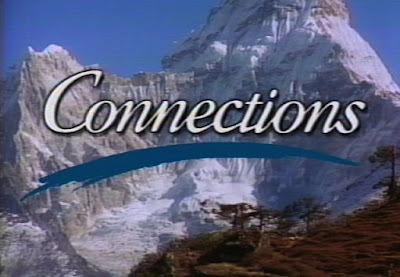 "Connections" was shot on 35mm film by Cinematographer Glenn Kershaw, A.S.C., who now produces the CBS-TV series, "Criminal Minds." The picture debuted as a short-subject for the 25th Anniversary re-release of "2001 A Space Oddessy." All of the special effects were executed under the supervision of Oliver Peters, then of Century-III at Universal. At the time AT&T claimed that the basic technology for any of the things you see already existed, but would only appear if based on perceived market-demand. While handing out accolades, let's remember Mike Elias, who was the editor of the program, Debbie Cibella who was line producer and Ross Cibella, executive producer, without whose leadership and dedication the project would not have happened. On a personal note, you and Rhea brought us all together through your personal leadership, making the experience personally as well as professionally rewarding. Discovered this blog today. Finding it very interesting. OK, so every time I'm looking at a screen, my phone will ring? I would think there would be a setting to prevent my evenings from being interrupted by phone calls! !